Got home from teaching my first class of the semester this evening to proof-review copies of Occultations from the new press and collective, Black Radish Books, the books having arrived via UPS in a rather unassuming box. Though there are some small things we're still tweaking, this small print run for advanced reviews prior to the larger run made available thru SPD, etc, is basically the book. And I am really pleased with the work Susana Gardner (cover) and Kate Robinson (interior) did, really quite enamored of their work. The book, I dare say, looks great. I'll take these with me to New York, send a few to the lovely folks who are so far reviewing it, and then wait till end of April for the rest to hit bookstores. If you're interested in a copy, feel free to email me backchannel; I'll happily reserve one for you. Again, a huge thank you to those who wrote blurbs for the book: Thom Donovan, Laura Elrick, David Buuck, CA Conrad, and Joan Retallack. And to those at Belladonna who are curating its release. 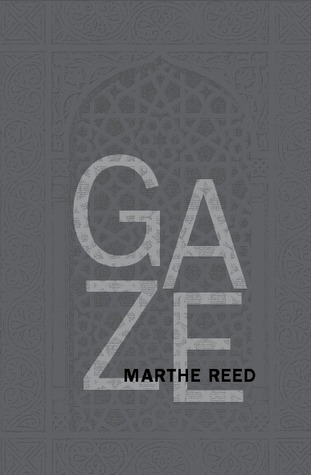 Speaking of Black Radish Books, the first book (my book is the second), Gaze, by wonderful poet Marthe Reed, is just about to be officially published, and just garnered a really right-on short review over at New Pages. Find the review here. Very cool--congrats to Marthe on this book. I'll review it here as well, once the book comes out and circulates. For any of you interested in the talk Reg Johanson and I gave at Pilot Books for the Poetry at Pilot Small Press Fest (as part of Big Pelt Talkie reading series), video excerpts are now online at Pilot's website. Enjoy. 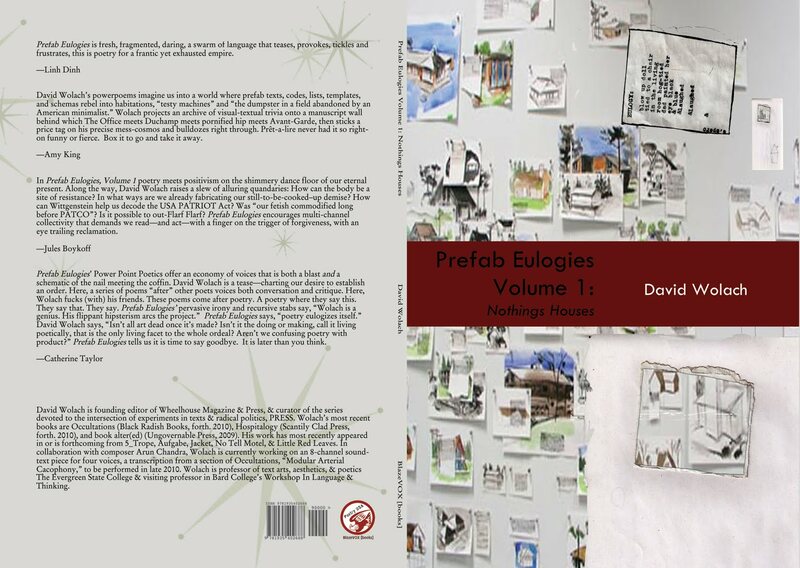 Prefab Eulogies, thanks to writer and editor of BluePrint Review Dorothee Lang, has been featured over at The Daily s-Press, a regularly updated website that features new books out from small presses. Thanks much to Dorothee and editors for the nice write-up. Cool site that rolls out new titles from various genres, then gives them a good amount of room for blurbs, short review, and book specs. Sadly, happily, Ugly Duckling is celebrating its 17 years at PS1, a lifetime of stellar, crazy, life-affirming events. I'm especially pissed I can't make Joel Schlemowitz's screening. Joel and I go way back, he and I union organizers together at the turn of the century. I met him as he first began organizing at The New School, his and his colleagues' hard work paying off in a landslide union victory, then a hard-fought and good first contract. Those were tough days, tough even finding other profs. in order to talk to them about joining our union, profs. whose lives included no permanent classroom or office, no real pay, no real health care. All I talked to when I finally found them seemed to ask in one way or another what took us so long? "Management! And also the architecture," I'd say. Hence it was an organizing of nomadic artists, several of us winding thru the halls of all those rundown buildings--the Fashion Institute being the worst, ceiling about to cave on us, each of us asking for a few bucks more and an occasional inspection for asbestos. The New School with the UAW has come a long way, & so has Joel. He's a deeply talented filmmaker, a crazy funny person, hence I'm not surprised that he's created such a stir, focusing in on all the peeps at Ugly Duckling. Ask him to show you his old camera collection. Or don't. But do go. What a warm night that should be. Do go! For me? No. Do go? 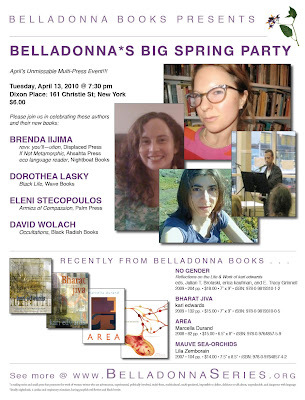 Not to even begin speaking of the several great readers at various events below--Rachel, Stacey, Rob, Peter Gizzi et al. A good lineup. And speaking of Rob Fitterman--he too was out there organizing with us in NYC. I met him first not as poet (tho since it's been a different story), but simply as person-standing-on-cold-February-picket line. A good soul, whose work in conceptual poetry--that sort of famously sharp transition--I love for its contiguity with Rob's earlier work in post-Oppen, post-Zukofsky sociopolitical archeology / investigatory surgery. To me the transition hasn't been quite as sharp or drastic as is often talked about, and further, this constant insistence on meeting and taking pleasure in the alterior, pushing oneself outside oneself, to me, speaks to the spirit of risky poetics, a poetics that seeks to re-articulate the subject's position within its found system of choices (or non-choices) and refuses to identify with that (lack). Each inversion, dismantling, set of moves, starting with the serial appropriative re-articulation Metropolis books, excites me--and to be so careful as one adventures thru catastrophe! With Place, NO IDEA ought to be quite some-thing curious. Nice hats too. Joel Schlemowitz screens and speaks about his award-winning documentary film, "Loudmouth Collective / Ugly Duckling Presse." Vanessa Place and Rob Fitterman: "NO IDEA". Followed by a wine reception. Free with admission to PS1. The UDP show closes on Monday, March 29, 2010. Quick note--DO check out the new issue of Critphoria. Oooh, there's a lot to sift thru here, so perhaps another blog post. For now, recommended--the issue includes among many other fantastic poets, work from Kristin Prevallet, Robert Kocik, Rodrigo Toscano&Nathalie Night, Thom Donovan, I could go on but I won't, so do visit them and dig in. I'm just getting started--found the issue while procrastinating this evening. Occultations Release Party--Just Part of the Story! Belladonna for inviting me/working to make this series happen. Brenda Iijima’s recent titles include revv. you’ll—ution (Displaced Press) and If Not Metamorphic (Ahsahta Press). She is the editor of the eco language reader (Nightboat Books and PPAYYL)—a collection of essays by poets responding to environmental issues. At present, she is writing an informal encyclopedia on animals used as surrogates by humans—the snake and the mouse are recent entries. As well she is researching the women who were murdered in her hometown of North Adams, Massachusetts and choreographing site specific dances that relate to these crimes. She runs Portable Press at Yo-Yo Labs (http://e2ma.net/go/8099297438/2659409/92635267/27410/goto:http://yoyolabs.com ) from Prospect Heights, Brooklyn. Dorothea Lasky is the author of two full-length collections of poetry: Black Life (Wave Books, 2010) and AWE (Wave Books, 2007). She is also the author of Poetry is Not A Project (Ugly Duckling Presse, 2010) and several chapbooks. Born in St. Louis in 1978, her poems have appeared in The New Yorker, The Paris Review, Boston Review, American Poetry Review, The Laurel Review, and Columbia Poetry Review, among other places. She is a graduate of the MFA program for Poets and Writers at the University of Massachusetts-Amherst and also has been educated at Harvard University and Washington University. Currently, she lives in New York City and researches creativity and education at the University of Pennsylvania. Eleni Stecopoulos was born on Fort Washington Avenue, raised on the Upper West Side and on Long Island, and now lives in Berkeley, CA. Armies of Compassion is her first full-length collection. She has published a chapbook, Autoimmunity (Taxt, 2006), and poems and essays in publications including Chain, Ecopoetics, Xcp: Cross Cultural Poetics, The Capilano Review, the SFMOMA blog, and NO GENDER: Reflections on the Life & Work of kari edwards. In 2008 she received a grant from the Creative Work Fund to curate a program series around art, healing, and somatic practice for the San Francisco State University Poetry Center, and write a related book. She is at work as well on a book-length poem, "Earth Also is a Private Language," which deals with things like rift zones and dream incubation and the history of her grandfather’s hometown on the island of Euboea, renowned since antiquity for curative springs once associated with cults of Apollo and Heracles. She teaches in the Language and Thinking program at Bard College and sometimes co-directs the Paros Translation Symposium in Greece. David Wolach is founding editor of Wheelhouse Magazine & Press, & curator of the series devoted to the intersection of experiments in texts & radical politics, PRESS. 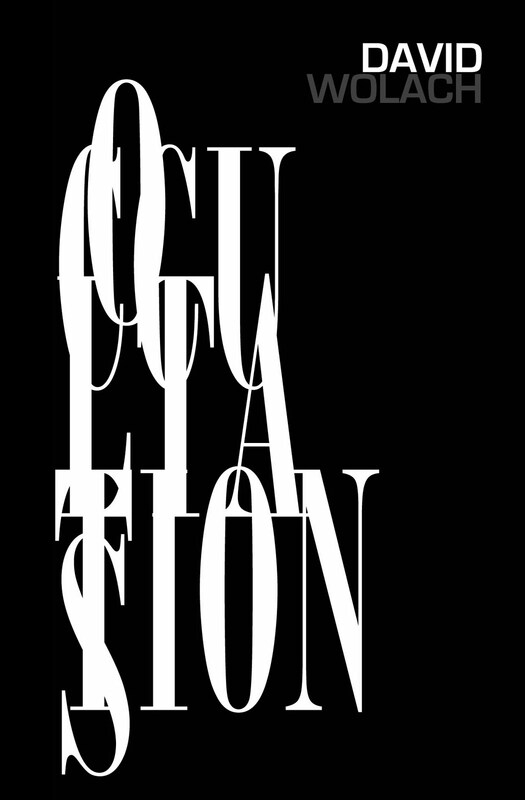 Wolach’s most recent books are Occultations (Black Radish Books, forth. 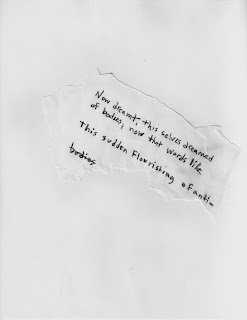 2010), Prefab Eulogies Vol 1: Nothings Houses (BlazeVox, forth. 2010), Hospitalogy (Scantily Clad Press, forth. 2010) and book alter(ed) (Ungovernable Press, 2009). His work has most recently appeared in or is forthcoming from 5_Trope, Aufgabe, Jacket, No Tell Motel, & Little Red Leaves. Often making use of multiple media and site-specific, Wolach's work has been commissioned for performance at such venues as The American Cybernetics Conference 2009, The EconVergence Conference 2009, and Tacoma Contemporary Series. Wolach is professor of text arts, & poetics The Evergreen State College & visiting professor in Bard College’s Workshop In Language & Thinking. I had a great time at Pilot Books, giving a talk and reading with Reg Johanson, as part of Big Pelt Talkie Series (and part of Poetry at Pilot March Small Press Fest). Many thanks to Pilot Books, Summer, and William Owen, curator of Big Pelt. Many thanks too to Reg and those who packed the small bookstore, sat either out of fear or--hopefully--interest for over 2 hours of difficult conversation, some poetry too. This was my first time (sadly) at Pilot, one of Seattle's treasures, a little cove of poetry books. The collection of work they have is quite amazing--not a ton of books, but extremely good picks, and I found myself wanting to spend all day in there or buying everything in sight. From Wheelhouse contributor William Walsh's Question Struck, a hard to find book that I've been very curious (ha) about, to a great chapbook selection, I was kinda drooling. Ended up going home with Kyle Schlessinger's The Pink, from Kenning Editions. Oooh, this book is good. More on that later. Reg gave a talk first (go to the link above and watch the video for a small part of it). Really amazing, clear and thought-provoking recounting of how he built his new chapbook, Escraches (Argentine word for outrage, also the movement in Argentina of those who continue to protest the disappeared by picketing the houses of former officials, during the military regime, who murdered thousands of dissidents). The work begins (on the cover, as if, or as, a pamphlet): "struck him in the head with an ax relieving / themselves on the monument." More on this work as I go further into it, from which he read and which deals with site-specificity (spatial practices), develops a poetics of documentary poetry (working with both found and non-found materials detailing a localized event, here, among other occulted phenomena, organizing the protests against the Vancouver Olympics in the face of terrible and underreported atrocity), while wrestling with how to make room for the subjective "I," to allow its felt sense of wounding (the body's or identity's "symptoms") to become--to both withstand (embrace), and resist its wounds. Working thru Joan Retallack's poethical pedagogy in relation to poetic practices, along with detailing some of the work I ended up discussing--site-specific and "re-articulatory" work by Kaia Sand, Laura Elrick, and David Buuck, Reg's talk was radicalizing, problematizing, and pleasurable--nothing pretentious or dogmatic about it. Which is how Reg is, who he is, and I admire this a great deal. Was great to see him again, much to think about with regard to his talk. I promise I did not know what Reg was going to do ahead of time. It was rather uncanny, tho, just how much our talks overlapped. I crafted a too-long set of questions/concerns circling around the poetics of spatial practice and methods or tactics I used in "writing" Occultations, and which others (I mentioned the corporeal rituals of Hannah Weiner and read from an essay on Elrick's Stalk) used in (or as) their work. Here, I spoke at the tactical level, talked about such corporeal practices as show up in these poem-sections as behaviors that seek to amplify the body-as-ecosystem's socialized markedness, shape, imprinted-ness left by late capitalism, here, specifically, the surveillance industrial complex--the increasing privatization of law's "enforcement." Fantastic poet/artist/editor and former Michigander (!!) Joel Felix (who, due to my hermitage, I met for the first time there) asked challenging questions about whether, thru a kind of abjection of "this body," the "here," (or thru amplifying the abject already extant), it is possible to, as Robert Kocik, who I leaned on for this talk, writes, "make new behaviors" and thus discover new "functions." And further, what those new behaviors would be--aside from speaking about them, where/what are they, have we arrived at any? And finally, whether my set of moves, even as tactics, whether they speak to a poetics that implies some form of transcendentalism? Tough questions, to which I didn't and don't claim to have answers. Robert Mittenthal and my partner Elizabeth were helpful here in thinking out loud. Answers, of course, are orthogonal to our interests here, and so as Joel's questions were picked back up in the discussion portion of the evening, Nico Vassilakis quite rightly scratched his head and asked where this every-few-years anxiety about the use value of "poetry" comes from. With Nico pointing out (rightly, I think) that there's good reason to suggest the best thing poetry can do is do nothing. A good reminder that a lack of some form of exchange value, or even use value beyond the thing in itself, if possible, affords a radical departure from normative discourses, vocabularies, in essence, the language of late capitalism. So goes the argument that otherwise, the drive for (in my case) a Rancierean intermingling of functions/behaviors in the service of X often constricts our practices and potentially makes poetry more, not less, vulnerable to the heteronomous market. Though I basically agree with this point, as hell, for most of my scribbles I couldn't tell you what they are doing or why they are beyond that they had to come out this way, I don't think there is a contradiction in saying that the aesthetic event, poetry say, can be both in and for itself (an essentialist position) and, in yet another context, have use value beyond itself--given that all these terms are not fixed, fluid. Further, there are too many people making strange and wondrous things to make a claim for "poetry" either way here, I think. Or at least I wouldn't want to stray from the particular instance to the general. Nor would Nico, I'd assume. Good discussion, tho. I really learned quite a bit from all who spoke up, went home puzzled and frazzled, which means something really good happened. Oh, and did I say I also went home with Kyle Schlessinger's Pink? A huge thanks to CA Conrad and to Robert Mittenthal for sharing their time and energy with Evergreen students as part of two separate PRESS events that occurred in the past two weeks. Conrad gave an amazing reading (ranging over work from his latest Heretical Text collaboration with Frank Sherlock, to work from The Book of Frank and Deviant Propulsion, to newer work that has yet to be published). The reading was followed by a captivating discussion. Seemingly without need for sleep, even rest, Conrad proceeded in the following days to fit in two workshops with different sets of students, culminating in the collaborative writing of a new (Soma)tic, which can be read here, on Conrad's (Soma)tic exercises blog. The several days we were together, Conrad continually brought people together in this magnetic, loving way, was truly wonderful to have around. We got so accustomed to his presence that we spent several days after he left trying to figure out what to do with ourselves. Luckily a week later Robert Mittenthal gave a fascinating (and fascinatingly different) talk and reading (from his forthcoming Chax book, Wax Works) in the intimate setting of my house (often referred to as "the shack"). Robert's talk essayed potential relations between philosophy of mind, poetry, and politics, working thru questions of agency and responsibility in poetry and poetics, giving close reading to the work of Isabelle Stengers, drawing out her exhaustingly interesting political ecology of fostering difference and cohabitation in order to challenge a more normative anti-authorial thread in much contemporary poetics as not going "far enough" if desiring to argue for something other than the author-as-non-author, or for Spinozan continuity in the service of rightly complicating simplistic notions of agency. I'll stop there and say simply, if interested in reading Robert's talk, it's available online here. And many, many heartfelt thanks to both Conrad and Robert. Not to say anything about the awesome contributions of Evergreen students and faculty who attended the events--see my post below for more about all that. Marthe Reed's wonderful, terse & lyrically tough Gaze is now available for review thru Black Radish Books. This is the first of 16 titles from Black Radish this year, with mine up next. Gaze will be officially released in April. If interested in reviewing this new work, contact Black Radish Books thru their website or contact Marthe directly by following this link. Congrats to Marthe. I'll review this book here as we get closer to its official release. For now, go--surprise yrself as I did in recently reading this extraordinary book. Thom Donovan, author of Make Believe (Wheelhouse Press, 2009), has just had his interview with artist Guy Ben-Ner published in BOMB. The interview is fascinating for two reasons, or, one contiguous reason in the form of ongoing conversation/investigation. Ben-Ner, maker of amazing short films that interrogate inner-outer/domestic space-the loneliness therein/the politics of family and friendship/the shipwreck of political catastrophe, is probably best known for his films "Wild Boy" and "Berkley's Island." 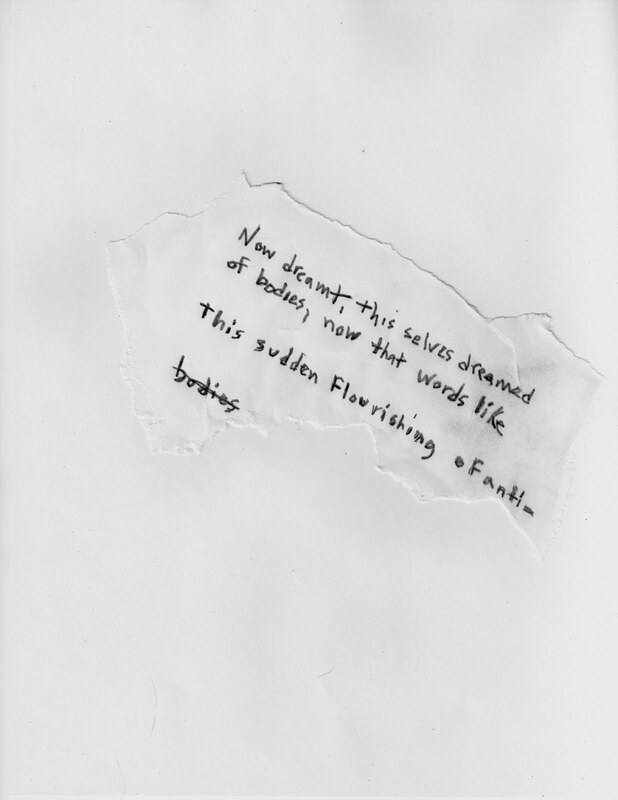 It's the latter that Thom wrote thru, as ekphrastic (or intertextual) poetry, the poem sequence becoming one part of Make Believe. Check both out. Between the chapbook, the films, and the interview, you'll have enough brain food to last you the better part of your alienated workday. FINALLY: Wheelhouse 9 & Chapbooks on Their Way! and several others. Features include a special reprint of the PRESS Anthology 2009, new film and animation, sound work, essays/reviews on the work of Lourdes Vazquez, and several political action updates. New chapbooks are forthcoming as well. 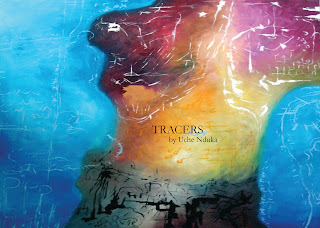 The first, to be released just ahead of the new issue, will be Tracers by Uche Nduka. Soon after that titles from Felino Soriano, Stan Apps, Laura Carter, Geoffrey Gatza, and Elizabeth Kate Switaj will roll out. On behalf of the Wheelhouse editors, thanks much for your patience. We're looking forward to throwing fistfuls of new text at you. Excited to get back into the classroom after spending this week writing evaluations (in place of grades) of myself and my co-learners, the students in my winter course on radical poetry and pedagogy. This past course was terrific, due almost entirely to the students/co-learners who, empathically and thoughtfully, created their own courses, enrolled in one-another's courses, and in each tried to rethink and implement pedagogical models (the writing workshop, as it were). Each course, taught by 3 or 4 folks, worked hard to create an environment that would be more generative than what we had been doing the first half of the course--which was, not accidentally, a more normative lecture/seminar jaunt thru some of the western alternative learning movements and their entanglements with trajectories in contemporary (or modern) poetry & poetics. Each of these team-taught courses generated good feedback; none, even when problems arose, failed outright, according to those who performed the roles of students in those courses. We closed out our semester (quarter) by coming back together to hear a talk and reading by Robert Mittenthal (who read a thought-provoking essay on pedagogy and his experiences with co-founding "Autonomous University"), which opened up the evening for an end-of-quarter student reading. Some beautiful, difficult, weird, and all in all pretty awesome work was shared by most in the class. Nice night, no house fires. Now on to a program I'm really stoked about--a larger (refashioned and deeper) version of a course I taught when I first arrived here at Evergreen, description below. What can it come to mean to perform the text? When the text becomes public utterance, what are the political/social dimensions of that move within particular contexts? In his wonderful--and too often overlooked--Overcoming Fitness, Robert Kocik proposes (or subjunctively muses for a world after Market Democracy America) the need for social services, "omitted" from our current neo-liberal fundamentalist culture. One is the "clinic for vestigial organ stimulation," which involves "recovery of the senses and physiological functions excluded as the body sealed around itself" (19). One way to to begin circling around the question of the use value of poetry, say, and further, the many implications of tracing out what "performing the text" can come to mean, is by taking Kocik's omitted clinic and building it. If I were to "recover" the senses and other physiological "functions" excluded by a definition of the body as "owned" rather than "rent," i.e., if I wanted to imagine fully a world in which the meaning of "body" is not parasitic on a presumed ownership (society), how I might I go about it? Perhaps there are an infinite number of ways I could, yet each attempt would not be in isolation--each "staging" (to use Ranciere's terminology) of an aesthetic event (which might be thought of as a political action too) would abut and confront and interlock with other bodies, and as such, a dependence, if not an interdependence would form. I could not be the sole proprietor of "this body," nor could I be the sole stake holder of its actions, its public utterances. In the subtlest way, say by quietly writing a poem and sharing it with my friend, I am inviting (perhaps) dialog thru difference, and with difference, an invitation to be vulnerable. This interdependence thru difference (as opposed to identification) is, perhaps, one necessary component of "community," and by extension, "a commons." What happens if we take these interrelated yet still foggy ideas into the wide-open and "go big" (and further) with them? Or: to approach the omitted (and thus to perform a kind of analysis of the present conditions which cause the omitting), those untried behaviors for which unanticipated functions might result, is to make those behaviors before digging much further into the questions we are posing. Starting with a problem, we cannot end with a further set of problems without problematizing (trying out, making) that problem, instancing it with a behavior that at the start could (perhaps will) appear to have no particular use whatsoever, and no "poetic" value--no use, but maybe only a tenuous relation to the problem(s) posed. And this is a radical move: to ask what performing the text can come to mean is to perform an erasure of our understanding of these terms in favor of making new behaviors (stimulating parts of our world that have yet to be counted as poetic, stylistically or otherwise, playing with materials that are perhaps not thought of as "suitable" poetic materials, i.e., vestigial) , leaving as little of our stilted definitions (our given understandings) behind. To ask the question then means to obliterate, or at least suspend, the question thru action that may seem to fall outside the domain of "poetry" or "theater," thru making the " unfit" "poem," say, and seeing what other (maybe surprising or paradoxical) questions shake out from there. Trying out new behaviors, often by translating (making use of) old behaviors into and thru each other, recording them (if those behaviors aren't already a kind of record-keeping) in concert with others, captures some (but not nearly all) of the spirit of "poets theater," and indeed guerilla poetry--the two terms here sometimes interchangeable, sometimes not at all. What the written, specifically, has to do with poets theater, is one question we'll seek to explore--both historically and as if the question has never been posed, i.e., experimentally (in the sense of "experiment" not "experimental"). Marx and Brecht loom large in many ways. But more so, specific instances of political catastrophe. So, the relations between catastrophe and poets theater and guerilla poetry need be explored. At the end of the day, however, despite some thorough background reading and encountering diverse instances of modern and contemporary performative works, I'm interested in what you, as co-learner, come up with, "individually," and in cooperation with one-another. If you are enrolled in this class, or hope to be (on the wait list), you'll receive an email from me about various aspects of the program. For now, if on waitlist feel free to contact me about getting into the program. And if in the program, as soon as you can, purchase The Kenning Anthology of Poets Theater, 1945-1985, edited by Kevin Killian and David Brazil. This text we'll work with after Week 1. Earlier readings (prior to digging into a few of the essays in this book) will be sent to you and available on our course blog (web address TBA) as pdf and/or link. Note: This 8-credit program will meet from 5:30 to 7:30 p.m. on Tuesdays and Thursdays and from 4 to 8 p.m. on Saturdays. First class meets in SEM 2 B1105. Program is preparatory for careers and future studies in the arts, creative writing, and education.